These tubs are made out of 1.2m high Cedar staves and supplied complete with wood fired heater, small circulation pump with filter to keep water clear. Air massage jets with stronger pump can be integrated in to the system. 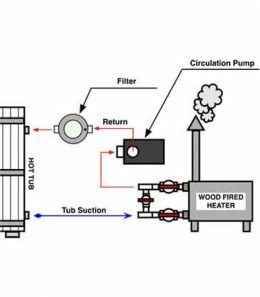 Tub with just wood fired heater (no circulation pump and filter) can be supplied too. Tub in this setup must be drained after each use since thermosifon affect is not enough to filter water in the tub.